Produced 3.3 million boe/d of oil and gas, a 3% increase excluding the effect of divestments and exits. 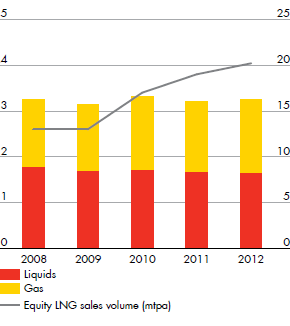 Sold 20.2 million tonnes of liquefied natural gas (LNG). 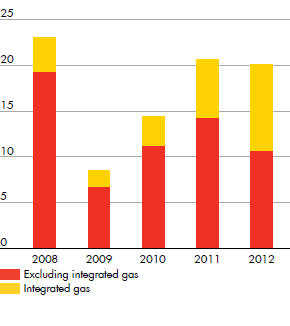 Added 4 billion boe of resources in 2012 from exploration and acquisitions, compared with 1.2 billion boe of production. Made seven notable new discoveries and appraisals in conventional exploration, including an appraisal at Appomattox, which now has more than 500 million boe potential. Took final investment decisions on Forcados Yokri and Southern Swamp in Nigeria; Tempa Rossa in Italy; Malikai in Malaysia; and North American liquids-rich shales. Increased participation in the Draugen, Schiehallion and Beryl fields in the UK North Sea. Acquired liquids-rich shales acreage in the Permian basin, Texas. Divested three oil mining leases onshore Nigeria for a total consideration of more than $1 billion. Found strategic partners for the Groundbirch project and Prelude FLNG, and diluted our stakes in these projects. Signed the first ever shale gas production sharing contract in China with CNPC. Announced a proposal for developing an LNG export facility in Western Canada with strategic partners called LNG Canada. Excludes net working capital movements.